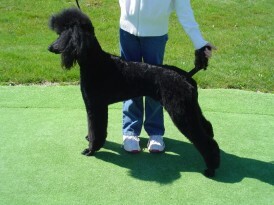 O'Kaylyn Farms Standard Poodles - look at me now! Oliver now makes his home in Houston, Texas. His "mom" was looking for a dog that she could live with that would not affect her allergies. Oliver is a real lover! "Torrie" makes her home here in northern Ohio. Her owners were empty-nesters looking for a new companion. Torrie is a very sweet and pretty girl, and we see her often. Her owners tell me she is a wonderful dog! Max was the runt of the '04 litter; he was so tiny we gave him extra care and grew very attached to him. 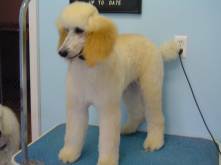 His new family did all their research for their very first dog and decided on the Standard Poodle. They made an excellent choice as Max has outgrown his "runty" image and become a beautiful young dog! 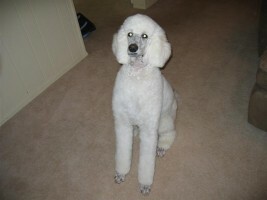 We see Max often, and he is a joy..
Seger was the largest puppy in the litter and he has turned out gorgeous! He's a chip off the old block (dad's), that's for sure! He has a wonderful personality and he is in training to be a bird dog! Super!! Charlie now makes his home in Sandusky, Ohio and travels extensively. He spends his summers on the Erie islands, he's already been to Alaska and swam in the gulf of Mexico! Charlie is about 80 lbs and has a super sweet and mellow temperament. He makes friends where ever he goes! He is from Chauntae and Trevor's 2005 litter. Camilla lives nearby and is from Sierra and Trevor's first litter. She is growing rapidly, and was already standing at 24 inches at only 6 months old here. She is a real sweety and turning into a beautiful young lady! My daughter had been asking for her very own dog since she was 4 yrs old; we told her when she was 8 she could have her own dog. Well, her 8th birthday came and went, and no dog for Kayla. There was "no room at the inn" so to speak. When our '05 Chauntae/Trevor litter was born and Kayla was about to turn 9, I told her to take her pick if this was her breed of choice. She studied many breeds. Trust me--she did her homework! She chose a black female and after much thought, named her choice "Lacey". Kayla handled Lacey herself from birth and spent every day with her. She did all her training herself and is still working with her everyday. Lacey is blossoming, and I'm very impressed with the devotion that she has to Kayla. She never takes her eyes off her, and to be honest, yes, she is spoiled rotten! It is truly a heartfelt love. Lexie is from Chauntae and Trevors '05 litter; she is the littermate to Lacey and Charlie. 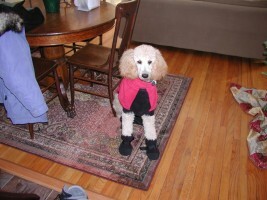 Lexie is the joy of her owners' lives and now lives in New York. Lily is from Sierra and Trevor's first litter. She lives in Wisconsin and has just welcomed a new human baby into their home. Mom and dad tell me Lily is great with her new human playmate! Jacque is from Sierra and Chase '08 litter, he was exactly what his new family was looking for, big and beautiful! Jacque makes his home in Michigan with his best buddy Bear. "I just wanted to drop you a line about Rizzo. He is doing just great, we took him on a road trip of New England this fall and he was fabulous, he stayed in hotels and slept with us in our tent. We took him hiking on trails in Acadia and he even carried his own water in his own backpack - he LOVED it. Attached is a picture of Riz on a beach in Maine, sitting on kelp and eating driftwood having a blast -- what a hoot he is, thanks again for selling him to us!" 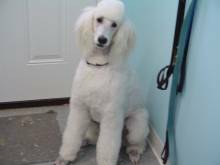 Jac is from 2009 Sierra/Chase litter, he lives with his family and big sister Belle a St Poodle in North Carolina, here he is at 9 mo old, handsome boy! Here's Luke at 9 mo. old he is Jac's brother from Sierra/Chase 2009 litter. Luke was always a big boy and at 9 mo he is 27 in tall and weighs in at 70 lbs. 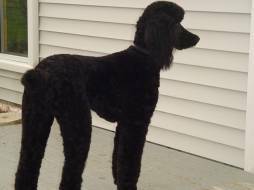 Luke lives in Ohio with his big sister, a Giant Schnauzer named Pearl.